When you hear the word “recliner” what comes to mind? 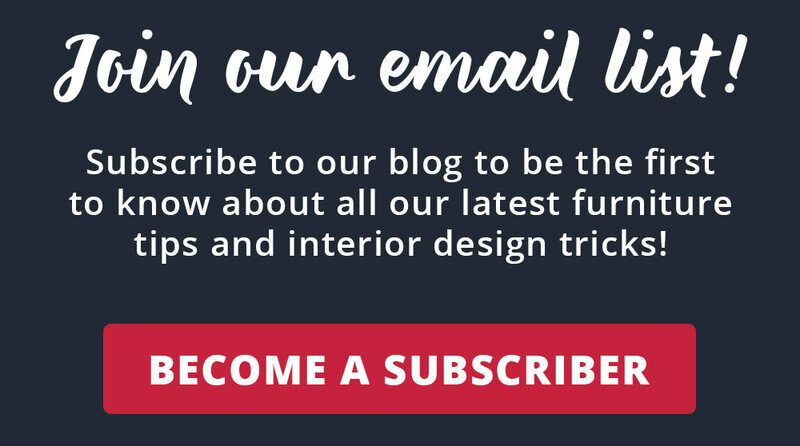 Are you picturing a cozy oversized chair? Do you imagine yourself sitting back on a cushiony, comfortable reclining chair? Have you ever considered adding a recliner chair to your living space? American Freight Furniture and Mattress has a huge selection of comfy and stylish recliners in a variety of shapes and sizes. In this post, we’re going to talk about three of our favorite recliners. The Garrett Graphite Recliner, Boardwalk Brown Rocker Recliner, and Saunter Swivel Glider Recliner are very different in terms of material, shape, and style. We’ll walk you through all the specs you need to know to make the best decision for your home. Let’s get started! If you’re looking for a classic charcoal gray chair, you can’t go wrong with the Garrett Graphite Recliner. Prop your feet up to watch TV or recline all the back for an afternoon nap. It’s easy to achieve top-quality comfort on this recliner. 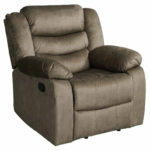 This manual rocking recliner features padded pillow top arms and dark gray polyester upholstery throughout. The back cushion has three sections of horizontal stuffing to contour to your head, neck, and spine. The arms sit flat and have an oversized shape for added comfort. The seat of the chair is firm, yet comfortable. It’s the perfect balance of a supportive and soft build. One of the best features of this recliner is the polyester material. It’s super easy to clean! If you get a spot on your chair, simply dampen a cloth with warm water and gently scrub the affected area. You can also use a fabric cleaner that’s meant for polyester and like-materials. Read the cleaning instructions on the tag before you begin treating your recliner chair. The standard dimensions of this chair make it easy to stage throughout your home. Plus, the monochromatic charcoal gray color will blend nicely with your current furniture. The lever for the manual reclining function is on the right-hand side. You can take home the recliner today for only $249! Sign up for 100% approved free layaway at American Freight Furniture and Mattress today. We also offer low, easy payments and same-day delivery for all in-stock items! Do you need a set? 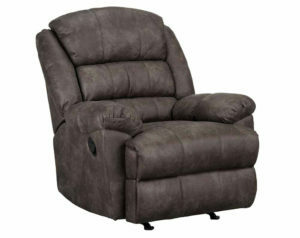 You can get a pair of the Garrett Graphite Recliner for only $496. Visit a store near you for more details. Recliners are among the most versatile furniture for living rooms and home theaters. We recommend staging your brand-new Garrett Graphite Recliner in the corner of a bedroom or sitting space near a window. This will create the perfect reading nook. For nighttime reading, make sure you place a table lamp on a small side table. Read about the benefits of adding a floor lamp nearby here. If you’re on the hunt for a modern recliner with an elevated shape, the Boardwalk Brown Rocker Recliner might be the perfect fit. This recliner looks sophisticated and feels smooth. We love the Boardwalk Brown Rocker Recliner because the mocha brown upholstery is perfectly paired with light topstitched detailing throughout the design. Unlike many other recliners, this chair has a square shape that elevates the style. The upholstery looks like leather but feels like fabric, which means you get the best of both worlds. Instead of bracing yourself for ice cold material in the winter or a warm and sticky surface in the summer, sit back and relax in comfort every season. Plus, it has an incredibly durable and low-maintenance fabric. The back cushions of the chair are separated into one section for back support and one headrest. The fold-over pillow top arm cushions are squared off and sit flat. We love how the armrests turn outward so you have more sitting room. This is ideal if you have pets who might want to sit on your lap. The lever for the manual reclining function is on the righthand side. The brown fabric is a blend of dark and light browns to create a warm mocha color. You can pair this reclining chair with nearly any earth tone living room. 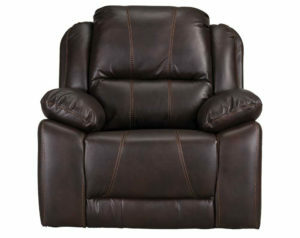 Make the Boardwalk Brown Rocker Recliner your own for only $399. Do you want to complete your living room? The matching Boardwalk 3 Piece Reclining Sectional Sofa is only $1,299. 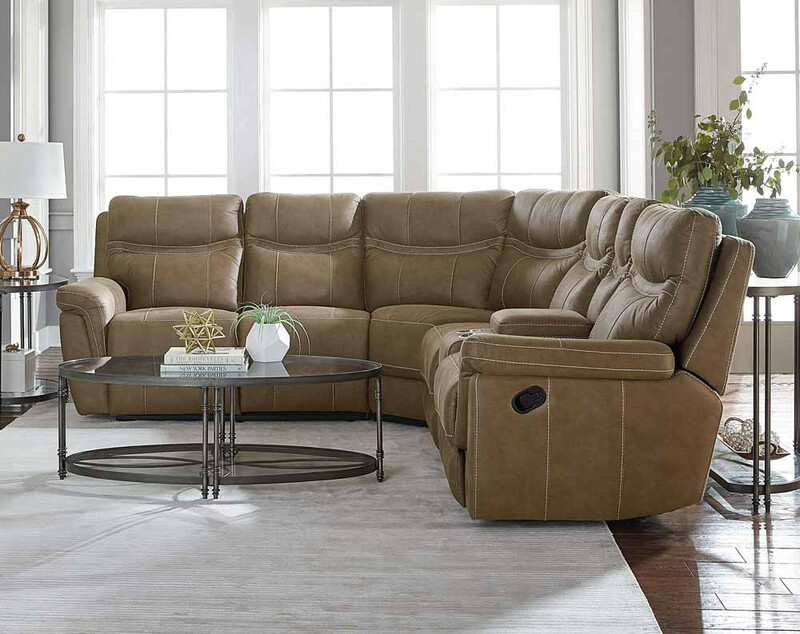 Stop by your local American Freight Furniture and Mattress to shop all our latest styles of recliners, sectionals, and sofa and loveseat sets. Make this recliner your brand-new comfy chair in a gaming room or entertainment den. We love to pair two matching recliners across from a TV and entertainment console for the perfect video game setup. Since the Boardwalk Brown Rocker Recliner is so sophisticated, we also love to add this chair to a home study, office, or library for extra seating. You need a recliner that’s so comfortable you don’t want to get up. But at the same time, it needs to blend beautifully with all of your other pieces. Enter the Saunter Swivel Glider Recliner. Just like the name says, it swivels, glides, and reclines with smooth perfection. You won’t want to pass on this modern rocking chair. Ditch your idea of comfortable recliners that look like they belong in your grandfather’s living room. 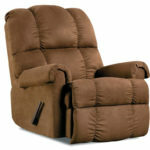 The Saunter Swivel Glider Recliner is all the cushion and comfort of a classic reclining chair without the dated look. 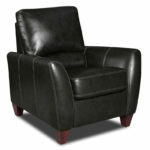 This modern recliner chair is a rich dark brown synthetic material that looks and feels like leather. The pub-style back and large pillow top arms create a classic cushiony build. However, the minimal stitching and large cushion sections make this chair look lavish and high-end. Melt into this chair for hours of watching movies and reading books. On the right-hand side, the manual “car door” handle releases the reclining function. The simple dark brown shade will add warmth to a neutral living space or make a basement home theater extra cozy. 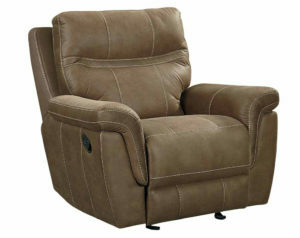 Visit your local American Freight Furniture and Mattress to try the Saunter Swivel Glider Recliner before you buy it. You’ll be amazed at how smooth the chair rotates and reclines. Dark brown is easy to pair with any living room theme. We love to add it to the Saunter 4 PC. Reclining Sectional Sofa to complete a sitting space. Pick up the sofa today for only $1,999 and the recliner for just $399. 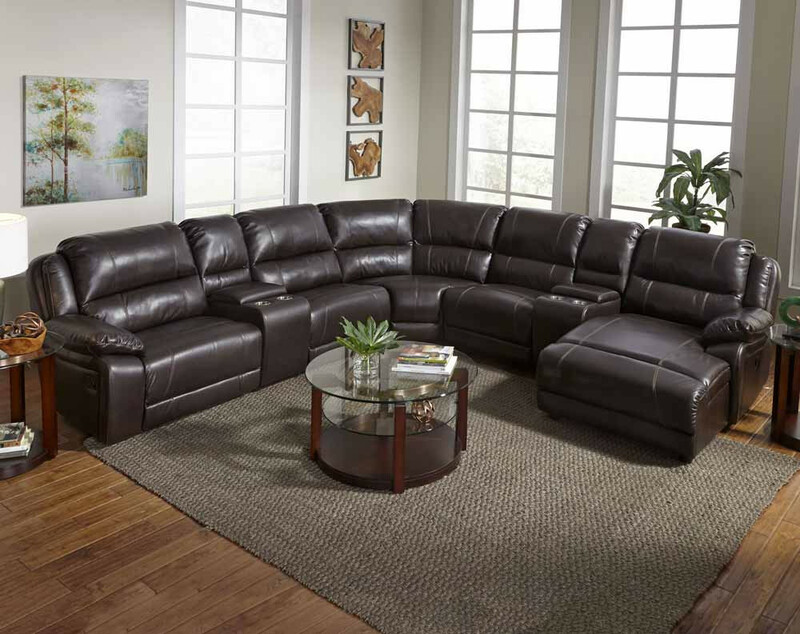 For more contrast, stage the Saunter Swivel Glider Recliner near a cloth sofa and loveseat combo. This recliner will match almost anything. 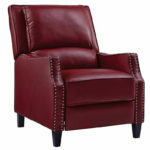 You need a rocker recliner somewhere in your home. Whether it’s an additional spot to sit in your family room or the center of attention in your library, a recliner chair is a great option. Rocker recliners are a great place for nursing moms to feed their babies and rock them to sleep. Recliners are compact chairs that instantly turn into the perfect afternoon napping station. Swivel recliners are easy to rotate between workstations and offer a cushiony place to sit. Perhaps the best part of recliners is the fact they come in so many different shapes and finishes. From pillowy polyester builds to simple synthetic leather chairs, there’s a cozy recliner chair for everyone. Read about another recliner called the Malibu here. If you don’t have room for a full sofa sectional in your studio apartment or tiny townhouse, choose a recliner! They offer all the comfort of a reclining couch without taking up so much space. American Freight Furniture and Mattress makes it easy to take home a brand-new recliner today. We offer 100% approved free layaway, same-day delivery for all in-stock items, and low easy payments. Learn more about our payment plans here. To find more rocker recliners on sale, stop into your nearest American Freight Furniture and Mattress and shop our latest deals. We’ll help you find a rocking chair for a nursery or matching recliners for a cozy reading nook. Click here to learn more about our other new products. Amazing, Nice collection. Really want to buy this black recliner for our living room.